Jawa is a very effective droid disabler and also good with Jawa allies. Let’s take a look at what he has to offer to your team. How to Get[Shards]: Data Cards, Holotable Battle 2-D. Dark Side 4-F, Dark Side 6-B. 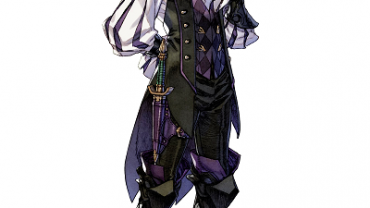 Basic Ability: Exploit Weakness – Deal Physical damage to target enemy with a 25% chance to inflict Speed Down for 2 turns. This attack deals 35% more damage to enemies suffering from a negative status effect. Unique Ability: Ambush Tactics – Jawa gains 6% Evasion for each living Jawa ally.In addition, Jawa gains 25% Turn Meter on Evade. 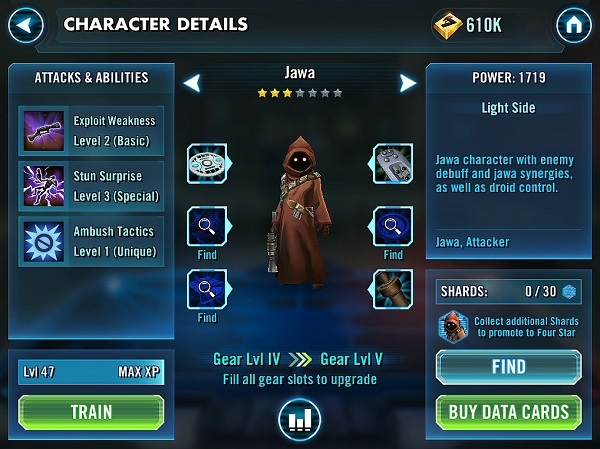 Jawa starts off great for a newbie team if you got him early in the game. He is the character you have to bring in Droid heavy campaign maps, which is a lot of them. He is able to stun droid teams easily if you are lucky. Unfortunately, it is only at 50% chance, so sometimes you don’t stun at all. He does deal good damage with both attacks. However, Jawa is very fragile and is vulnerable to focus fire attacks and usually the first one to die if you didn’t bring a tank. That is why you need to bring Chewbacca or Poe Dameron to make sure he rarely gets targeted. He pairs very well with Poe Dameron due to his expose ability, dealing bonus 20% health to enemies when using Jawa’s AoE special attack. He does fall off late game to other strong AoE damage dealers like Hk-47, IG-88, Old Ben and Darth Sidious etc. Therefore, not many use him past mid game. Verdict: Level until you get better AoE characters. Do not max it, there are better characters. Hi, will ambush tactics work on Jawa alone? In essence, does he count as his own living ally? Gaining his own buff? Or is it a useless trait to level without other jawas? I am not sure, will have to do some testing on that.